Well, hello there, my friends! Have you missed us? Still adjusting to our new surroundings here in New Jersey so blogging has been a bit off this past month or so. But don't worry! 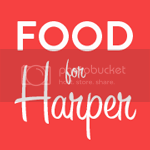 Harper is still eating fancy lunches everyday so I have quite a bit of backlog (to say the least!). It's been pretty nice being able to eat lunch with my children each day. It is definitely a favorite part of my day. We all eat the same thing, just a little different. I, obviously, eat much more than they do. And, Adler (we have a 17 month old little boy! ), he eats his food cut in little bits so his hands can grab. I definitely need to substitute some things for him. In this lunch, here, he will not eat tomatoes. No siree. Those would be on the floor. Instead, he ate cucumbers (his favorite! ), and I ate tomatoes AND cucumbers. Harper's lunch here is in an EasyLunchboxes container. 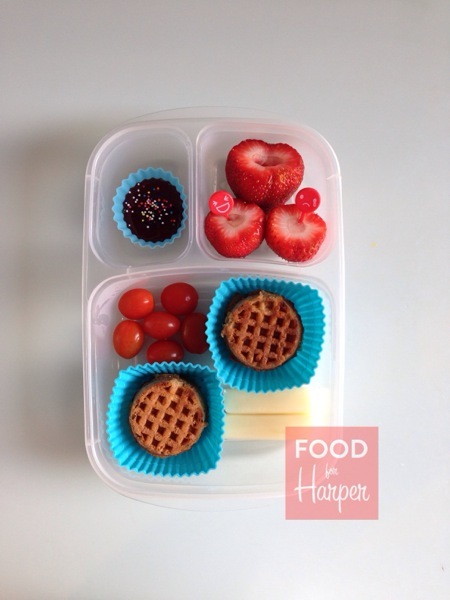 She has Van's Mini Waffles with cherry tomatoes and Polly-O String Cheese. The waffles are in Wilton Square Silicone Baking Cups. She also has strawberries with very cute Face Picks. These picks come in a pack of twelve and show a variety of different moods. Love them!! The small container holds Bonne Maman Apricot-Raspberry Preserves. Harper uses this to dip her waffles.